Altered androgen hormone homeostasis and androgen receptor (AR) activity have been implicated in ovarian carcinogenesis but the relationship between AR expression in ovarian cancer and clinical outcome remains unclear. In this study, the prognostic impact of AR expression was investigated using immunohistochemistry in tissue microarrays from 154 incident cases of epithelial ovarian cancer (EOC) in the prospective, population-based cohorts Malmö Diet and Cancer Study and Malmö Preventive Project. A subset of corresponding fallopian tubes (n = 36) with no histopathological evidence of disease was also analysed. While abundantly expressed in the majority of fallopian tubes with more than 75% positive nuclei in 16/36 (44%) cases, AR was absent in 108/154 (70%) of EOC cases. AR expression was not related to prognosis in the entire cohort, but in the serous subtype (n = 90), AR positivity (> 10% positive nuclei) was associated with a prolonged disease specific survival in univariate (HR= 0.49; 95% CI 0.25-0.96; p= 0.038) and multivariate (HR= 0.46; 95% CI 0.22-0.97; p= 0.042) analysis, adjusted for age, grade and clinical stage. AR expression is considerably reduced in EOC as compared to fallopian tubes, and in EOC of the serous subtype, high AR expression is a favourable prognostic factor. These results indicate that assessment of AR expression might be of value for treatment stratification of EOC patients with serous ovarian carcinoma. Epithelial ovarian carcinoma (EOC) is the second most common and the most lethal malignancy of the female reproductive tract . Etiological factors involved in ovarian carcinogenesis remain poorly defined, and effective treatment protocols are limited. Alterations in androgens and androgen receptor homeostasis have been implicated in ovarian carcinogenesis and progression [2–5]. While several immunohistochemistry (IHC)-based studies have confirmed widespread AR expression in EOC [6–8], data describing it as a prognostic biomarker are relatively sparse. One study describing a large series of tumors (n = 322), found no association between AR protein expression and clinical outcome , however individual histological subtypes were not examined. Increased levels of AR mRNA have been described in cells from normal ovarian surface epithelium as compared to ovarian cancer cells, the majority of which were derived from serous tumors . We are, however, unaware of any studies describing AR expression in fallopian tubes, from which a substantial but not yet not fully appreciated proportion of serous ovarian carcinomas are thought to arise . The purpose of this study was to analyze the prognostic impact of AR expression in 154 EOCs collected from two population-based, prospective cohorts. Based on the in vitro data described above , our hypothesis was that AR protein expression may be down-regulated in EOC compared to fallopian tubes and the prognostic value of AR would become more obvious when tumors were stratified into serous and non-serous histological subtypes. Tumors (n = 154) from all incident cases of invasive EOC that had occurred in two prospective, population-based cohorts, the Malmö Diet and Cancer Study (MDCS) and Malmö Preventive Project (MPP) cohorts  up to Dec 31st 2007 were collected and histopathologically re-evaluated. The MDCS was initiated in 1991 and enrolled 17035 healthy women . The MPP was established in 1974 for screening with regard to cardiovascular risk factors and enrolled 10.902 women. The standard surgical management was a total abdominal hysterectomy, bilateral salpingo-oophorectomy and omentectomy with cytological evaluation of peritoneal fluid or washings. Routine pelivic lymphadenectomy was not performed. Residual disease was resected to less than 1 cm where possible. Volume of residual disease was not availabe. Standard adjuvant therapy was combination of paclitaxel and platinum-based chemotherapy. TMAs were constructed as previously described. Two 1.0 mm cores were taken from viable, non-necrotic tumor areas, when possible from both ovaries, and from concomitant peritoneal metastases (n = 33). Fallopian tubes with no evidence of histological disease were also sampled from 38 cases. Four μm TMA-sections and 3μm full-face sections were deparaffinised and rehydrated. Heat mediated antigen retrieval (pH = 9) was performed using the PT-link system and IHC was performed in the DAKO Autostainer system (Dako, Glostrup, Denmark) using mouse monoclonal anti-AR antibody (1:200 dilution; AR 441, LAB VISION, Warm Springs, CA), anti-ER antibody (1:50 dilution; M 7047 Dako), and anti-PR antibody (1:400 dilution; M 3569 Dako). To control for heterogenous expression patterns, IHC was also performed on full-face sections from 15 randomly selected cases and compared to corresponding cores. AR expression was also examined on full-face sections from fallopian tubes obtained from 10 patients who had undergone hysterectomy for benign disease. Spearman's Rho correlation and the χ2test were used to estimate the relationship between AR expression and clinicopathological parameters. Kappa-statistics were used as a measure of agreement between scoring of tissue cores and full-face sections. Kaplan-Meier analysis and log rank test were used to illustrate differences in ovarian cancer specific survival (OCSS) between strata. Cox regression proportional hazards models were used to estimate the relationship between survival and AR status, age, stage and grade. All calculations were performed using SPSS version 17.0 (SPSS Inc, Chicago, IL). P values < 0.05 were considered statistically significant. Thirty-six of the 38 fallopian tubes were suitable for analysis. AR protein expression was evident in the majority of fallopian tubes with > 75% positivity seen in 44% (n = 16) of cases (Figure 1). AR was also abundantly expressed (> 50%) in 10 fallopian tubes with a benign diagnosis (data not shown). Immunohistochemical AR staining and distribution in fallopian tubes, ovarian cancer and omental metastases. 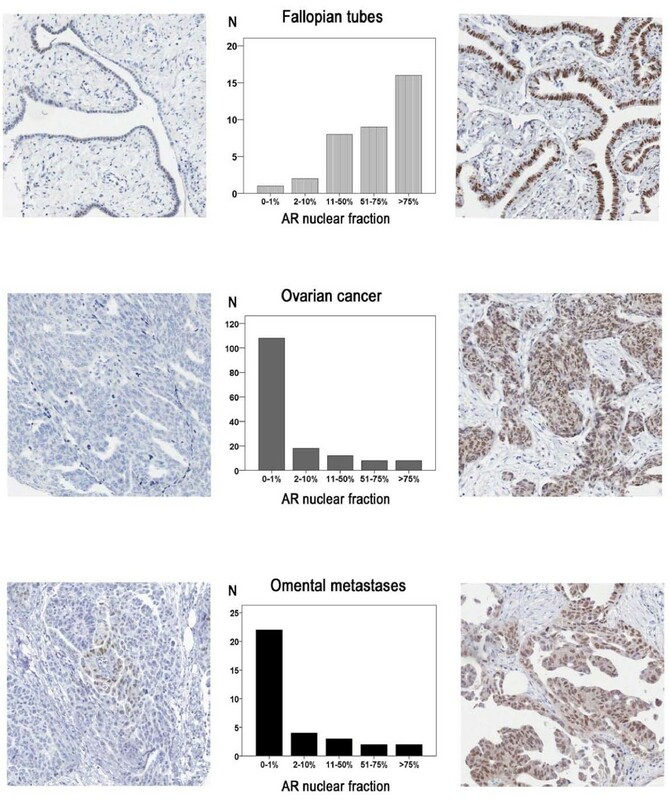 AR nuclear staining was assessed as the percentage of positive tumor cells (grading 0-1%, 2-10%, 11-50%, 51-75%, >75%).Examples of tumors with low AR expression are visualized in the left panels and tumors with high expression in the right panels. Bars in the middle represent the distribution of positive cases in absolute numbers. All primary tumors (n = 154) and metastatic deposits (n = 33) were suitable for analysis. Compared to tubal epithelium, AR protein expression was lower in primary tumors and metastases, with absent expression in 70% (n = 108) of primary tumors and 67% (n = 22) of metastatic deposits (Figure 1). AR expression in primary tumors correlated with expression in metastases (R= 0.95, p < 0.001) particularly when serous carcinomas (n = 90) were analyzed separately (R = 0.97, p < 0.001). No correlation was seen between tubal AR expression and expression in either primary or metastatic tumors. As samples from all three locations were only available for six patients, this study did not allow for a meaningful analysis of AR expression related to individual tumor progression. AR expression in full-face sections correlated with TMA-based scoring (kappa-value 0.87, p = 0.001, n = 15), suggesting that AR is a suitable protein for TMA-based analysis. No significant association was evident between AR expression in primary tumors and conventional clinicopathological parameters in the entire cohort (n = 154) (Table 1). In primary tumors, AR expression was associated with ER and PR positivity (Table 1). Subset analysis of serous carcinoma's (n = 90), revealed that the association between AR and ER positivity remained significant, whereas the relationship with PR expression was lost (Table 1). AR expression was also associated with well-differentiated serous tumors (Table 1). Analysis of the entire cohort (n = 154) revealed no relationship between increased AR expression (> 10%) in primary tumors and outcome (Figure 2A). However, subset analysis in serous carcinomas (n = 90) revealed that increased AR expression was associated with a prolonged OCSS (p = 0.034) (Figure 2B). Cox univariate analysis confirmed the association between AR and OCSS in serous carcinomas (HR= 0.49; 95% CI 0.25-0.96; p= 0.038) and this association remained significant in a multivariate model controlling for age, grade and stage (HR= 0.46; 95% CI 0.22-0.97; p= 0.042). 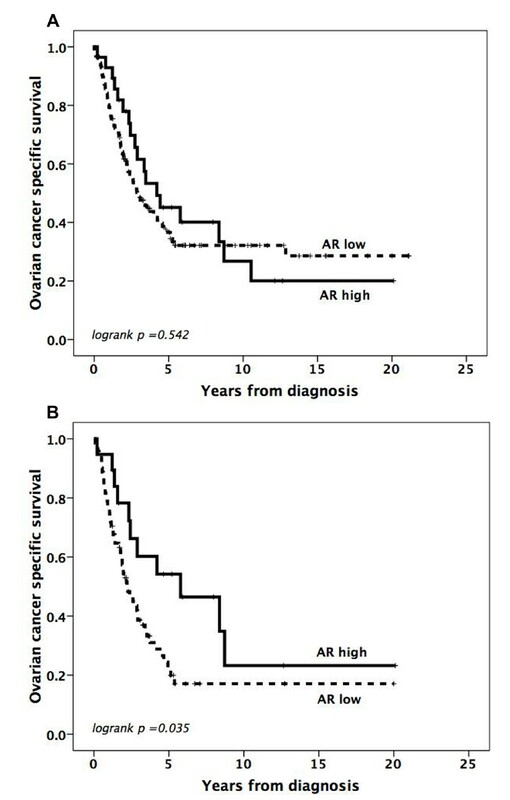 AR was not prognostic in non-serous carcinomas (data not shown). Impact of androgen receptor expression on ovarian cancer specific survival. Kaplan-Meier curves visualizing OCSS according to AR expression in all tumors (A) and serous carcinomas (B), using a threshold of 10% positive nuclei to define low and high AR expression. The total number of events was 52/71 (73%) in AR high serous tumors and 11/19 (58%) in AR low serous tumors. Evaluation of AR protein expression in 154 EOC cases from two large, prospective population-based studies demonstrated frequent expression of AR in fallopian tube epithelium irrespective of the presence of ovarian cancer and decreased AR expression in primary ovarian tumors and metastatic deposits. While not conferring a prognostic value within the entire cohort, reduced AR expression was an independent predictor of decreased OCSS in serous tumors. The main limitation of this study is the absence of data on residual disease and future studies of AR expression in EOC should incorporate this in any multivariate analysis. While associated with AR expression, neither ER nor PR expression correlated with survival in this study. Such findings contrast with Lee et al. who reported PR, but not ER or AR expression as an independent predictor of good prognosis . In their study, however, the prognostic value of hormone receptors was not analysed in strata according to different histological subtypes, an approach that has been deemed an essential component of EOC biomarker studies. These findings further highlight the heterogeneity of ovarian cancer, which should not be considered as a single disease, but rather several distinct entities with different clinical behaviours. These entities are in part reflected in histopathological characteristics and therefore, to obtain better prognostic and predictive information biomarkers should not only be assessed across entire cohorts, but also in histological subgroups. Although androgen receptors are expressed in normal ovarian surface epithelium, we are not aware of any previous reports describing AR expression in tubal epithelium. Recent reports have suggested that a significant proportion of serous carcinomas arise within the fimbrial tubal epithelium [10, 17, 18]. Our findings indicate that malignant transformation could involve a downregulation of AR in certain EOC cases. AR expression in primary ovarian tumors and metastases was quite similar, suggesting that downregulation of AR occurs early in ovarian carcinogenesis. This is to our knowledge the first report on AR expression in EOC from population-based cohorts, potentially representing a selected part of the background population. Nevertheless, as established prognostic parameters, i.e. clinical stage and histological grade, are highly significant indicators of survival in this cohort, its use for assessment of investigative prognostic markers is justified. These data demonstrate that AR is an independent marker of prolonged OCSS in patients with serous carcinoma of the ovary, and thus a potentially relevant biomarker for treatment stratification in this subgroup. Our findings also highlight the need for further studies investigating the influence of both lifestyle-related and genetic factors in relation to ovarian cancer risk in general and to AR-defined subtypes in particular. This work was supported by grants from the Swedish Cancer Society, Gunnar Nilsson's Cancer Foundation, the Crafoord Foundation and the Research funds of Skåne University Hospital, Malmö. The UCD Conway Institute is funded by the Programme for Third Level Institutions (PRTLI), as administered by the Higher Education Authority (HEA) of Ireland. BN carried out the immunohistochemical analysis, performed the statistical analysis, and drafted the manuscript. NZ and EN carried out the immunohistochemical analysis and drafted the manuscript. JB collected the clinical data. JM participated in collection of clinical data and drafted the manuscript. DB performed the statistical analysis and drafted the manuscript. KJ participated in the conception and design of the study, performed the histopathological re-evaluaton and drafted the manuscript. All authors read and approved the final manuscript.